Calling all car fans, the Mazda Raceway Laguna Seca Car Week is once again returning this August. Prepare yourself for an entire week filled with exciting events. Throughout the week you’ll have the opportunity to see hundreds of cars from class hot rods and muscle cars to luxury and sporting cars. Read on to learn about all the exciting events that are in store for you during this year’s Mazda Raceway Laguna Seca Car Week from August 11-17th. The Monterey Car Week Kick Off event will take place on August 11th from 5-7pm with a classic car show taking place in Old Monterey. There will be 30 classic cars all lined up along the street for guests to enjoy. There will also be live music and fun giveaways. This event is FREE to attend. On the 12th and 13th there will be a Monterey Pre-Reunion show at the Mazda Raceway where guests will be able to look at over 300 race cars that will be competing. Guests will be allowed to explore the historic racing area and even watch as teams work on cars in the pits as they prepare for the race. On August 15th head down to the famous Ocean Avenue for the classic Concours on the Avenue event. 18 blocks in Carmel will be closed off as nearly 200 cars come to town to be showcased. There will be a mix of American as well as foreign cars and those displayed will range from muscle cars to luxury cars and hot rods to sporting cars. This event is FREE to attend and will run from 10am - 5pm. Other events that will be held this week include an expo, collector auction and more. 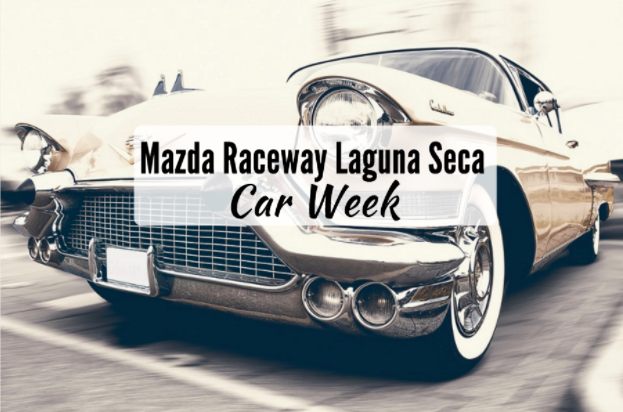 Click here for a list of all events that you can find at this years Mazda Raceway Laguna Seca Car Week.